Yesterday evening I was invited to a Witch Blogger party at the Hay House office in London's Notting Hill. The special witchy blogger social evening was timed to take place just before the launch of Lisa Lister’s new book Witch: Unleashed, Untamed. Unapologetic. Lisa led a lovely witchy ceremony to start the evening, and then everyone enjoyed punch from the cauldron and some delicious food and had a chance to chat with the Hay House staff and authors as well as bloggers and other creative people. I was given a copy of Lisa's book in a goody bag, which I am looking forward to reading and will review on my blog. 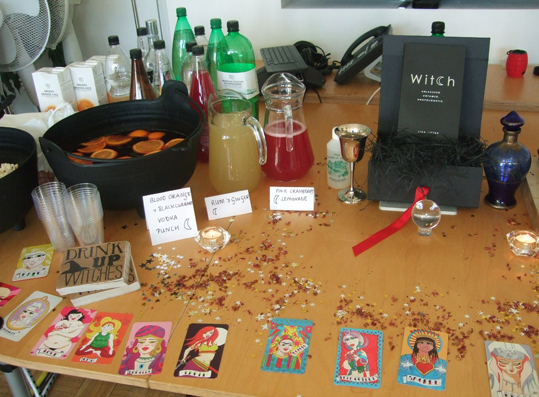 The picture shows the cocktail cauldron, Lisa's book and some of the divination cards she has created. And I know that at the next party I have, I want a cocktail cauldron too - maybe full of midnight margaritas! On each of my Pagan Eye posts, I show a photo that I find interesting, with a few words about it.